The all-new, second edition of The Incomplete Guide to the Wildlife of Saint Martin will be officially released on July 23rd, 2013. The second edition features over 100 new species, hundreds of new photos and all-new descriptions and text. The second edition also features brand new sections about St. Martin habitats, island ecology and a history of biological research on St. Martin. Like the first edition, this book is a unique guide to all the terrestrial wildlife of St. Martin, from mammals and birds to reptiles and insects. It includes over 500 color photographs, and features hundreds of species, including those which are found only on St. Martin. The text includes detailed information about both the biology and the local history of the animals featured and is written to be accessible to persons of all ages and backgrounds. The book is available in stores and gift shops on St. Martin (scroll down for a list), and for download. Download this book and many more at Les Fruits de Mer. The Incomplete Guide to the Wildlife of Saint Martin, by Mark Yokoyama, is the best, and most complete, natural history book I have read about any single Caribbean island. The text is enlightening and entertaining and the photographs are superb. I spent a lot of time on Saint Martin studying its wildlife, but I learned even more from this volume. The gentleman naturalist is back! In earlier times, each region had a self-taught expert that explored nature and explained its wonder and diversity to the local community, and Mark Yokoyama is that man for the island of St. Martin. Sharing his world through abundant crisp photos of birds, lizards, insects and plants in a clear and often wry style, this book delights as much as it informs, and will be a tremendous motivation for other naturalists to do the same. Drawing you in with stunning photography and keeping you engaged with captivating species accounts, The Incomplete Guide to the Wildlife of Saint Martin is the island’s most detailed biological inventory yet. Naturalists and conservationists will keep it with their reference books, backyard explorers will take it to the field to ID species and nature lovers may just read it cover to cover. We need more books like this on our islands. 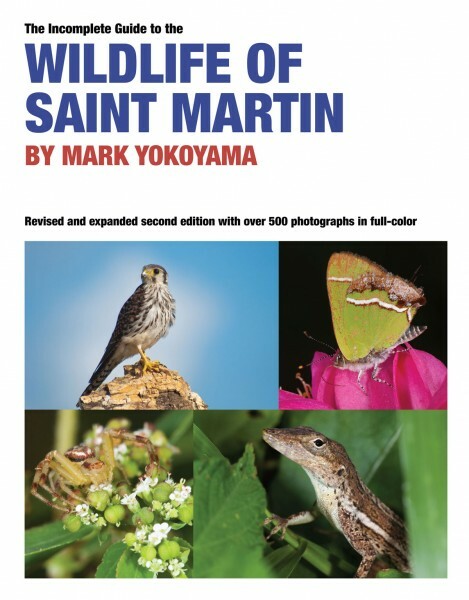 Mark Yokoyama’s The Incomplete Guide to the Wildlife of Saint Martin is an exquisite compilation of photographs accompanied by just enough authoritative text to make this the guide of choice for residents and visitors alike. Anyone with an interest in nature will be motivated to search more diligently for these fascinating animals, the discovery of which will elicit rewards that can only enhance an appreciation for this gem of an island. The sections on habitats, island ecology, and biology on St. Martin through the years, although relegated to the last few pages of this remarkable little book, add a dimension often lacking in guide books and serve to place the emphasis on wildlife into a proper perspective. This guidebook is a groundbreaking contribution to natural history for St. Martin and surrounding islands. With spectacular photographs, the author has managed to make even the most obscure insect a fascinating creature. The book is easily accessible to novice naturalists while also offering many new insights for the experienced wildlife observer. Yokoyama’s enthusiasm for his subject is contagious and will certainly prove to inspire young and old to get outside and see what wonders await them. I highly recommend this book to anyone with an interest in the natural history of St. Martin or other islands in the Lesser Antilles. An excellent guide to the fauna of this fascinating island. We have had the privilege to observe Mark Yokoyama from the days when he did his research for his first book and now this new publication. He has been able with his enthusiasm, patience, skills, knowledge and techniques to create this magnificent document on our wildlife in a way that not only informs us about species we never knew we had, but also to invite us to go out in the “wild” and search for them ourselves. We recommend that this book should be in every school and every home on the island as well as in the libraries of our visitors. Click link for a list of store locations.